Learn how to begin beekeeping to have a ready source of honey, wax and a far more productive garden. Not only that, but you will also help keep this precious insect from going extinct. While no one is certain of the reason, bees are rapidly dying off and need our tender loving care to stay alive. That's why it's so important to learn how to keep bees and keep several hives on your property. The good news is, you can keep bees whether you live in the country or in the city. Bees typically travel up to five miles away from their hive to collect pollen and can live anywhere, so consider keeping bees even if you have only an urban backyard. If you plan to have bees in the spring, spend the winter beforehand investing in the equipment you need and learn how to begin beekeeping. There is a a lot of good beekeeping information available here. Also, a good book to have on hand is Beekeeping For Dummies by Howland Blackiston. January is typically the time when you need to order your bees, although you can find them for sale sometimes by looking on Craigslist or by joining a local beekeepers club. The easiest and safest investment is to order a three-pound package of bees (complete with a queen) from a bee supplier. 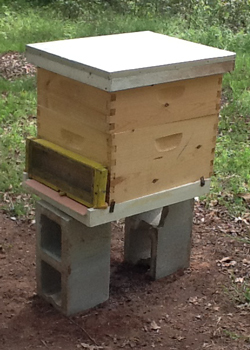 Or you can buy a "nuc" colony (four or five frames of bees plus a queen) from a local dealer. I've done both, and prefer ordering a package of bees. 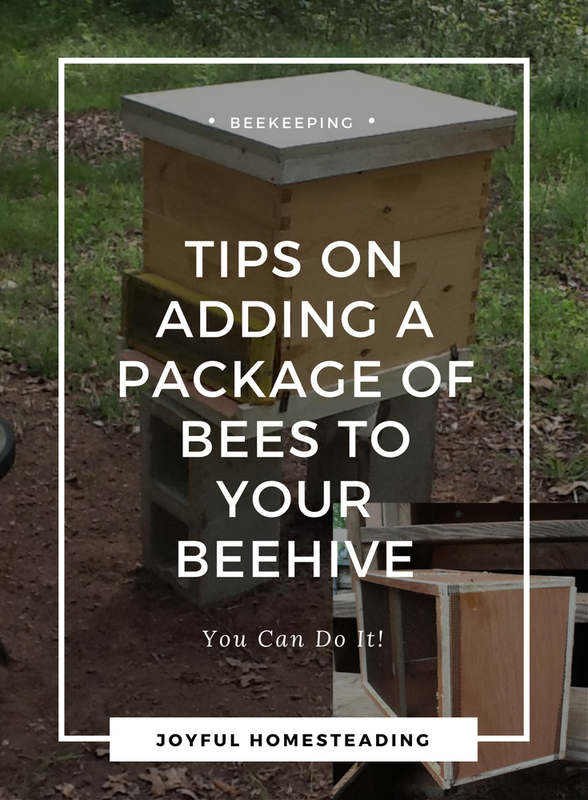 Before the day your package arrives, build your hive and get everything ready. You can learn about the beekeeping equipment you need here. Also make up some bee syrup and have it on hand in a spray bottle (find the recipe here). My latest bees arrived in this box. Although it is called a package of bees, it is actually a wooden box about the size of a shoe box with hard cloth on each side to keep the bees in but also allow an oxygen flow. The queen will be in her own separate container hanging inside from the top of the box. Spray bee syrup on the bees to keep them from flying away and keep them occupied licking the syrup off each other. It will also give them a much-needed energy boost. The queen container will either be a two-inch long rectangular wooden box with ventilation and corks on each end or a small plastic container with a plastic lid. If your queen comes in a plastic container, you will need to pry the small, round plastic lid out of the top of the queen container. Inside the container is a sugar tablet that your queen will eat through to get free. By the way, open the top of the queen container and not the bottom, in case one of her attendants dies before she can get free. That way the attendant's body won't block the entrance and she will be able to get out. 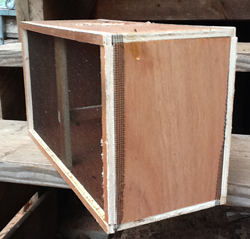 Once you are certain that either the cork or plastic container has been removed, hang the queen container on one of the frames inside the hive. Then turn the bee container holding the rest of the bees upside down and tap it, dumping the bees into the hive. Spray your bees once more with the sugar solution and close up the hive. Wait a couple of days and then check your hive to make sure the queen escaped the queen container. After that, check your bees once a week and feed them regularly that first year to ensure healthy growth. You can also learn how to begin beekeeping by watching helpful videos like this one. This video was produced by Brushy Mountain Bee Farm and shows you step by step how it's done. Related article: How to make bee syrup.